Today firms are part and parcel of the modern capitalist state enterprise. Aside from provisions of the state, firms provide the goods and services people consume, as well as wages (the means of consumption). It is worth asking, then, if early firms had a part in the emergence of the modern state. This paper briefly examines the role of the largest business enterprise of its time, the Dutch East India Company (VOC), in the formation of early-modern Netherlands. It finds that the VOC had an important role in the emergence of an independent Dutch Republic in 1648. The Netherlands, from very early in its history, had a dynamic and varied economy. The Holland region circa 1500 already had the highest urbanization rate in Europe, with 40 percent of labor in early forms of industry, 20 percent in services, 15 percent in fishing and peat digging, supported by a mere 25 percent in agriculture. In addition, it was already dominated by wage labor (at a time when Western Europe on average had only a quarter of its population producing for wages). Politically the Dutch Republic was unique. From its outset in the tenth century free peasants inhabited the region with property rights over their land, relatively lax feudal structures were in place, and nobility were weak. During the latter stages of the Middle Ages the merchant class began to secure control of the town and municipal councils in the provinces of Holland and Zeeland. This process was exacerbated during the opening years of the Eighty Years’ War when Sea-Beggars retook coastal towns from Spain and placed themselves at the head of the councils. There was considerable variation in political control, however. Regions like Guelderland and Friesland, for example, remained in the hands of the nobility and landowning farmers. In 1568 war broke out with Spain. By 1579 the Seventeen Provinces of the Netherlands, first brought together under Charles V in 1543, were split. The southern provinces, having been substantially decimated by battles with Spain, had already pledged allegiance to the Habsburg Spanish King Phillip II. The northern states, meanwhile, united around William of Orange and banded together as the Republic of Seven United Provinces under the Union of Utrecht in 1579, were intent on fighting the Spanish. There are, then, many occasions across history one could point to as the founding of the Dutch State. For the purposes of this paper we will take this founding event to be the Treaty of Münster in 1648. This is not at all unreasonable. Prior to this period, though seven states had come together to form the Dutch Republic, the future of the Republic was very much in doubt. The war with Spain consumed considerable resources and it was not at all clear the Dutch union would emerge independent of Spain as it did at the end of the Eighty Years’ War. Indeed, 1648 seems to be the consensus of scholars as to when the Dutch State first arose. This choice also facilitates an examination of how the Dutch East India Company, what would become the world’s largest business enterprise, aided in the Dutch Republic’s founding. Traditionally, each voyage of a particular ship constituted its own “firm” (or rederij), with several partners coming together with equity shares sometimes down to the 1/128th ownership fraction. Ships traveling further east, however, were four times as expensive and took at least twice as long to return, increasing risk for investors. Sub-shares began being sold to friends and family, but an even more permanent enterprise was required for true success. 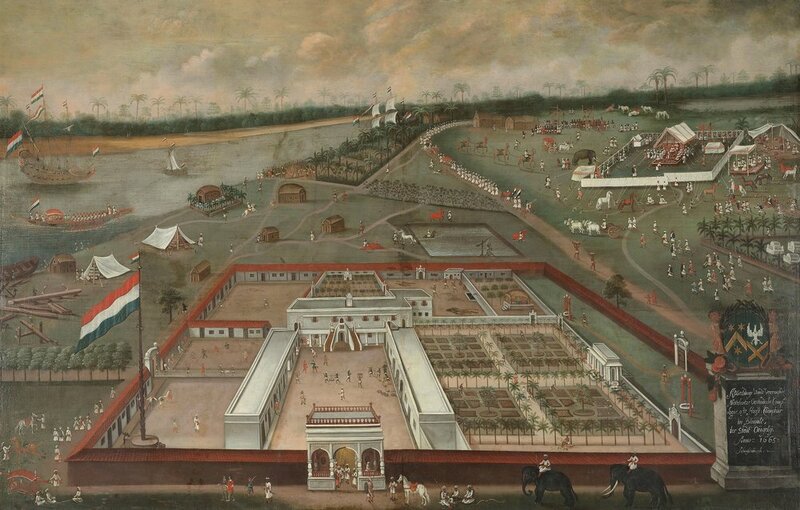 In 1602 the States-General persuaded several existing partnerships to come together and form the The Dutch East India Company­—or Vereenigde Oost-Indische Compagnie in Dutch (hereafter referred to simply as “VOC” ). By 1607, after four rounds of equity financing, investment in the VOC stood at 9 million guilders. By the seventeenth century town and municipal councils had come to be largely controlled by the merchant class. This in turn meant that the States-General, the national governing body, was also largely influenced by merchants. The VOC, then, was an institution created by merchants for merchants. It was a State before the Dutch Republic itself had acquired full statehood. The VOC could enter into treaties, enlist soldiers and wage war, and build fortresses and outposts abroad. This gave it unrivalled economic freedom as well as the substantial political power that came with the profits. There were three economic contributions the VOC made toward the formation of the Dutch State: increased liquidity in capital markets, the emergence of Amsterdam as the central European hub for information exchange, and general economic stimulus through employment and colonization efforts. All three led toward state formation through roughly the same means: helping to fund the Eighty Years’ War against Spain. Firms in early seventeenth century Netherlands had two primary forms of raising funds. The first type was the dividing of equity shares. These were split between two or three, but up to 15, partners. The second form of fundraising was IOU issuance (essentially an early form of corporate bond). By 1600 these debt issuances varied in amount from 600 to 3,000 guilders and ranged from three to 12 months. The problem was that neither method was particularly liquid. Information asymmetries made the price of finding the probable success of a particular shipping venture costly. Since early operations were small, there was a perceived risk about whether the returning vessel would be loaded with enough tradable goods to recoup the initial costs and have enough leftover for interest payments. This hindered the development of a market for buyers of both the equity and debt financing. This changed with the formation of the VOC. Share-ownership was split substantially more than previously, with about 1,100 initial subscribers in Amsterdam (which had a population of only 50,000). Perhaps more importantly, the VOC established a set of procedures to transfer ownership between parties. Shares were easily tradable by means of double-entry registration in the company’s ledger. What resulted was the Bourse, the world’s first stock exchange. The exchange led to the use of shares as collateral for loans on the money market, reducing transaction costs over other forms of collateral such as commodities. Indeed, from 1602 to 1620 interest rates on short-term debt dropped from nearly eight percent to 5.5 percent. The primary cause of this drop was two-fold. The first reason was the increased liquidity of financing instruments described above. The second was an increase in capital availability as merchants immigrated to Amsterdam; this phenomenon was itself likely caused, in some part, by the rise of the VOC. With time the Bourse grew and, along with the Dutch Central Bank founded in 1609, played an important part in maintaining Dutch credit. The availability of Dutch debt financing persisted even as Dutch borrowing continued and war expenditures crested at 13 million florins (90 percent of total outlays). The VOC made three important contributions in the area of information networking. First, the VOC, in an attempt to streamline its operations in marketing, ordering, and price setting, began compiling information from its vast overseas network of colonial outposts. Later, it hired correspondents specifically to fill the role of information reporter. Second, the VOC aided in the distribution of information. The directors of the VOC, the so-called “Heeren XVII”, and other high-level company officers, were often members of the political merchant oligarchy. As members of this commercial group, they would share information coming in from abroad with other elites who would in turn share it with their friends and family, and so on. Information would then spread down through the commercial classes until it became common knowledge. Third, in an attempt to forecast commodity prices, seasonal and yearly variations in importation of goods, and supply and demand across Europe at large, the VOC instituted a process of archival record keeping. As with other types of information, the forecasts that were rendered from studying these archives became public knowledge. Even today there are about 4,000 meters of shelved VOC archival documents worldwide. The VOC was a massive organization, especially for its day, and as such was large enough to have a substantial effect on the larger Dutch economy. Between 1602 and 1796, 1,772 ships made 4,785 passages to outposts in the “East Indies.” Over these two hundred years nearly one million Europeans rode aboard its fleet for short- or long-term visits to southern Africa and Asia. At its height 3,000 VOC employees worked in the Dutch Republic at offices, warehouses, and shipyards while 12,000 seamen manned its fleet. In total, more than 2.5 million tons of goods from Asia were brought back for trade. (Compare this to the VOC’s nearest competitor, The British East India Company, which carried only one-fifth the total tonnage on traffic of 2,690 ships). In addition, the substantial number of colonial outposts established by the VOC no doubt acted to project Dutch power abroad, transforming it into a world power. The VOC was truly the behemoth of the world’s commercial trading system during these two centuries. Profits came with its success. From 1630 to 1730 the average annual profit was 2 million guilders, of which fifty to seventy-five percent were distributed as dividends with the remainder being reinvested. Although it is not possible to know the exact magnitude of the VOC’s effects on the Dutch economy on the whole, it no doubt had a substantial impact. The rise of the VOC paralleled a gradual rise in living standards for the average worker. Yearly income of urban day-laborers rose from 195 florins in 1600 to 292 by 1650, and from 270 to 384 for the middle class worker. This in turn paralleled a steadily increasing reliance on tax revenue that, along with government debt, helped to fund the war with Spain. It is clear that the VOC had a powerful positive impact on the Dutch economy and as a result helped it to rise ever further above the Malthusian trap, a process Francis Fukuyama identified as a prerequisite for state development. Additionally, it aided directly in the surge in the Dutch economy that kept credit flowing and incomes, and therefore tax revenue, rising. All of this is simply to say that, despite being part of a broader and richer network of economic and trading activity, the VOC in particular seems to have played an important role in funding the war against Spain and thus ensuring the establishment of a Dutch State. The VOC, with this quite remarkable declaration, demonstrated it felt supremely confident with its preeminence within the wider Dutch system. This is likely because the States-General themselves had chartered the company years earlier and bestowed it with such broad latitude. This political influence was magnified by the rather prominent position of Holland, and in particular Amsterdam (home of the main VOC office), in broader Dutch political decision-making. In theory, the Seven Provinces of the Dutch Republic were each autonomous and sovereign with the House of Orange acting as stadtholder responsible mostly for military affairs. The Dutch Republic has often been thought of as an exception to the standard pattern of divine right monarchical or absolutist centralization as a prerequisite for state formation. And it was certainly an exception to the model of prolonged war leading to strong centralized government as it did in Western Europe. In fact, the States-General had essential no national political authority to do things like impose a national tax—this was done at the provincial level. In practice, however, Holland came to fill the role of the central authority. This stemmed simply from its substantial economic contribution to the Republic. Nominally, Holland carried a “mere” 58 percent of the Dutch Republic’s financial burden, but in practice its sway equated to far more. This gave the region increased negotiating power—if a particular policy was to be implemented, Holland must first be convinced. For alas, if Holland happened to disagree, the autonomous nature of the confederation allowed for the province to simply boycott implementation. But this in turn would almost certainly prohibit funding for the policy since invariably Holland would end up footing the bill for any legislation that passed. The famous Johan de Witt, for example, known as “the first Dutch Statesman” for his leadership leading up to and during the Anglo-Dutch wars, was the largest shareholder in the Zeeland chamber of the VOC. The VOC was economically and politically the single most important Dutch enterprise and conducted the bulk of its business in Holland, which itself supplied the majority of wealth and tax revenue to the Dutch Republic and had the political sway to prove it. It stands to reason, therefore, that aside from its economic role in Dutch State building, the VOC had an important role in exerting centralized political authority on other Dutch Republican provinces. Although the Dutch Republic was, de jure, a loosely confederate body of seven autonomous provinces, it was, de facto, a republic with Holland as its head. And there was no more important enterprise in Holland, and indeed in the Republic, than the VOC. The company founded a stock exchange, employed thousands of workers, supplied countless trade-goods from its colonies aboard, and helped transform Amsterdam into the hub of Europe. By doing so, the VOC created a financial platform to help secure a victory in the must-win war against Spain. Stevens, Dutch enterprise and the VOC, 1602-1799. De Vries, The first modern economy. Boxer, The Dutch seaborne empire, 1600-1800,. Hart, The making of a bourgeois state. Bavel, Bas J. P. van, and Jan Luiten van Zanden. “The Jump-Start of the Holland Economy during the Late-Medieval Crisis, c.1350-c.1500.” The Economic History Review 57, no. 3. New Series (2004): 503-532. Van Boven, M.W. “Towards A New Age of Partnership (TANAP): An Ambitious World Heritage Project (UNESCO Memory of the World – reg.form, 2002)”, 2002. Boxer, C. The Dutch seaborne empire, 1600-1800,. [1st American ed.]. New York: Knopf, 1965. Fritschy, W. “A ‘Financial Revolution’ Reconsidered: Public Finance in Holland during the Dutch Revolt, 1568-1648.” The Economic History Review 56, no. 1. New Series (February 1, 2003): 57-89. Fukuyama, Francis. The origins of political order : from prehuman times to the French Revolution. 1st ed. New York: Farrar Straus and Giroux, 2011. Gelderblom, Oscar, and Joost Jonker. “Completing a Financial Revolution: The Finance of the Dutch East India Trade and the Rise of the Amsterdam Capital Market, 1595-1612.” The Journal of Economic History 64, no. 3 (2004): 641-672. Hart, Marjolein. The making of a bourgeois state : war, politics, and finance during the Dutch revolt. Manchester UK ;;New York: Manchester University Press  ;Distributed in the USA and Canada by St. Martin’s Press, 1993. Smith, Woodruff D. “The Function of Commercial Centers in the Modernization of European Capitalism: Amsterdam as an Information Exchange in the Seventeenth Century.” The Journal of Economic History 44, no. 4 (December 1, 1984): 985-1005. Stevens, Harm. Dutch enterprise and the VOC, 1602-1799. [Zutphen]: Walburg, 1998. De Vries, Jan. The first modern economy : success, failure, and perseverance of the Dutch economy, 1500-1815. Cambridge ;;New York: Cambridge University Press, 1997.